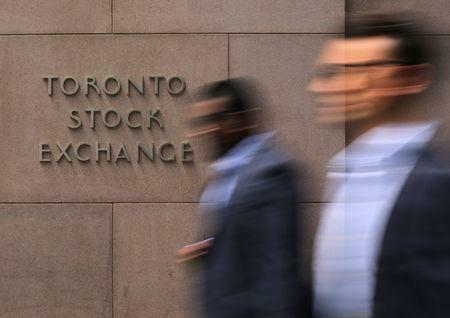 (Reuters) - The Toronto Stock Exchange's S&P/TSX rose 11.78 points, or 0.07 percent, to 16,013.49. * Leading the index were Aphria Inc , up 13.0 percent, Canopy Growth Corp , up 7.4 percent, and Stars Group Inc , higher by 7.2 percent. * Lagging shares were Alacer Gold Corp , down 4.5 percent, Interfor Corp, down 4.2 percent, and Guyana Goldfields Inc, lower by 4.1 percent. * On the TSX 111 issues rose and 123 fell as a 0.9-to-1 ratio favored decliners. There were 5 new highs and 8 new lows, with total volume of 194.3 million shares. * The TSX's energy group fell 0.47 points, or 0.25 percent, while the financials sector climbed 0.91 points, or 0.3 percent.